Fat Pad Heel Injury: Discussion, symptoms and treatment. One of the main roles of the heel fat pad is to even out the effects of loading the body weight onto the foot. Just like the crumple zone in a modern car, the longer a collision takes, the less the forces per second are. This is true of a car taking a longer time to ‘crumple’ to a stop against a solid object, and for your body weight to stop its travel towards the ground as you land from each step. The second role of the heel fat pad is to protect the bony prominences on the bottom of the heel. As you could imagine, a heel bone, covered only with skin, hitting the ground repeatedly would be prone to damage of both the bone and the skin over it. The fat pad is composed of fat cells (adipose tissue) held within a matrix of fibrous connective tissue a bit like a kitchen scrubbing pad. Fatty cushioning tissue covers all of the weight bearing parts of the bottom of the foot. It is especially thick and resilient in the heel. Collagen fibres bind the pad into place against the calcaneus / heel bone and the skin and nearby structures. How does a Fat Pad Injury to the heel occur? Fat pad heel injuries are usually caused by either a single sudden impact or by repeated smaller traumas to the fat pad. With repetitive stress, swelling can occur within the tissue. This can cause the layers of the fat pad to become less tightly bound to each other. The more fluid the pad collects, the more movement can occur between the layers and this can cause an escalating problem over time. In extreme cases, the fat pad can be displaced or moved out of position. This leaves the heel without the proper cushioning it requires and is a very serious, painful and debilitating condition. Sudden impact fat pad contusions are usually caused by big events such as falls from heights, skydiving or other activities that can cause a large sudden load to the foot. Repetitive stress to the fat pad is very commonly caused by running, start and stop sports, changes in directions and poor footwear choices, especially when running or under heavier load. Heel pain that stays fairly constant. It is unlikely that you will have ‘good days’ with this condition. Sometimes blood will seep from the heel pad to bruise the skin. Risk Factors for a Fat Pad Heel injury. 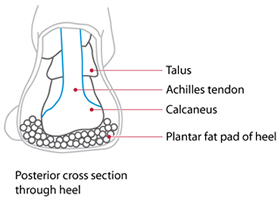 How is a Fat Pad Heel injury Treated? A fat pad contusion can initially be treated with rest, ice and elevation. A podiatrist should be able to help decrease the pain of a fat pad heel injury by strapping the area to limit the movement of the pad while walking. The condition can take a long time to resolve, depending on the severity of the trauma and you may need to learn how to strap your own heel for convenience. Your podiatrist can give you a lesson in this technique. The use of pain medication such as paracetamol is generally more useful than anti-inflammatory drugs in the long term. Use a shoe that has a well fitted heel counter as well as lots of cushioning under the heels. Neural Prolotherapy or Perineural Injection Therapy may help to reduce the pain of the condition and can significantly reduce the time taken to recover. This treatment is available at each of our locations but only with practitioners with additional training. Please ask when booking.